binTone latitude 150 only £20. bought in store not sure if national. £29 on Amazon. Shared Via The HUKD App For Android. What can you do with these? I bought these so we can communicate with another vehicle on a long road trip. 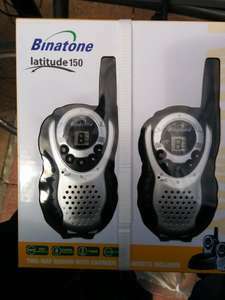 Simple and fun to use, the Latitude 150 twin walkie talkies from Binatone offer free communication over distances of up to 3 kilometres (1.8 miles), making them ideal for a wide range of uses such as camping, skiing, keeping in contact with your children in theme parks, and various outdoor activities. The Latitude 150 two-way radio is compact and features a moulded grip on the handsets for ease of use. Both handsets come with a belt clip to enable easy storage when on the move. The Latitude 150 also features a rechargeable battery with charging pod, saving the cost of new batteries. The Latitude 150 comes with eight channels for maximum communication, adjustable volume control, a low battery warning to give you advance warning of your batteries running out, a channel scan function which enables the user to search for other users on the same channel, talk confirmation (a Roger beep) to indicate when other users can talk, LED signal strength indicator, and keypad lock which helps prevent radio settings being changed by accident. Talk to other people with PMR446 radios, these do not have CTCSS which allows multiple groups to share the same channel so you have 8 channels. Range wise to be realistic in a built up area your talking 100m up to 500m possibly more, out in the sticks with no obstructions you can get a few kilometers. Awesome for car to car communication or keeping in touch with each other, as these are legally usable all over the EU they can be great when abroad. We use these at work for lone working. Good bits of kit but do pick up interference now and again. I should add that I bought these in the Chelmsford Asda store. Deal posting newbie! This is theronpoker first deal post. Help out by leaving a posting tip or just to show your appreciation for their contribution.